Investing in hardwood flooring in Lexington Park, MD, provides you with long-lasting, dazzling floors that will never go out of style. As more and more homeowners are making the move to professional hardwood floor installation, the real estate market has rewarded them with increased listing prices. Not only will a hardwood surface increase the value of your house, but it will also improve the livability of your home, providing easy maintenance along with stunning style. Sit down with one of our friendly associates and start a discussion about your particular approach to style. Our association with a national retail flooring group gives us a great deal of buying power, and we pass on those savings directly to the clients and customers we serve in the community. Every product in our flooring store is rated by our 5-Star rating system. Many of the 4- and 5-Star products come with our Confidence Plus Warranty. If you are unsatisfied with your purchase of these rated products after living with them for 30 days, we will replace them at no additional labor cost to you. Purchase with confidence when you establish a lasting partnership with our local flooring source. Once you have chosen your new hardwood floors, it is time to get them installed. Installing wood flooring requires a specialized set of skills and the right tools for the job. In fact, many of the problems a hardwood surface develops over the course of its lifetime can be directly attributed to errors in installation. Protect your investment and save a great deal of time and money in the process. It’s important to only use the most qualified and experienced installers for this essential task. Fortunately, our local showroom has a team of installation experts that are ready to get the job done right the first time. Area homeowners count on the Lifetime Installation Guarantee we stand behind with all of our products and services. The right hardwood floors can easily add a significant level value of your property, impressing guests and potential buyers alike. This upfront investment will often pay for itself through this increased sale price, while looking great for years. For this reason, it’s important to make the right choice for your style and the needs of your space, selecting from our wide variety of hardwood floors. Identify the wood flooring that matches your approach to style and the way you live your life. When you visit our showroom during the planning stages of your next remodeling project, you have the opportunity to talk with one of our design professionals. These knowledgeable specialists are ready to point you in the direction of a wood flooring choice that is easy to maintain and durable when it needs to be. There are two basic types of hardwood when it comes to flooring. The first includes solid varieties, including cherry, oak, and maple. Our selection of solid hardwoods also includes exotic species. 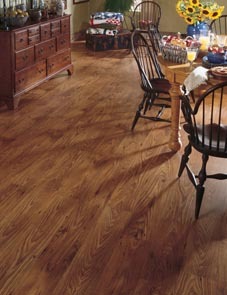 The second basic variety of wood flooring is our engineered hardwood. Solid hardwood floors are the classic choice for easy elegance, lasting a lifetime with proper care. However, to prevent natural expansion, it is important to keep these solid wood surfaces at between 40%-60% humidity throughout the year. In areas where this is unfeasible, engineered hardwood can be the solution. These planks are produced from several varieties of wood fused together. This moderates the natural expansion and contraction of the wood, providing increased durability without sacrificing the elegance of hardwood. Engineered wood is also suitable for any level of your home, making it a great choice for an upstairs room. Contact us today to secure the hardwood flooring you need for your signature home interior. We proudly serve customers in Lexington Park, California, Leonardtown, Beauvue, and Saint Clements Bay, Maryland, and surrounding communities.